A house should be a home. Vaguely translated, this means that your house should be a place people wish to live in, a habitable home they can feel comfortable in rather than a cluttered garage where things are arranged as if by a child. The things you must take into consideration when making your house comfortable for its inhabitants as well as for the guests who come to visit are space issues, lightening issues, and most importantly, furniture. While it is expected that a lack of proper spacing and a faintly lit interior will produce a claustrophobic and gloomy environment, these issues are generally dealt with in the construction of the house. What remains within your power is the ability to buy the proper furniture, especially that of the dining room. 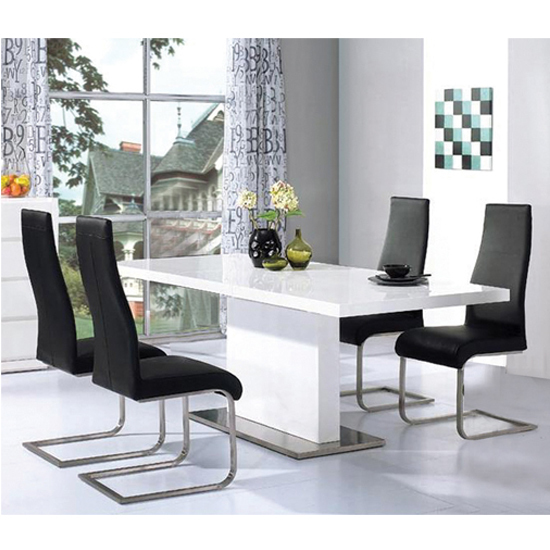 Remember that there are different styles of dining room furniture , with a traditional look including high gloss tables with high backed chairs. This is generally the most common and considerably the most elegant arrangement. However, what must be kept in mind is that color combinations matter. The shade of your walls, the lightening available, and the look you are going for will be very much affected by what shade of furniture you choose to go with. Furniture with a hue that clashes with its surroundings can produce a bad effect over all. Recommended color combinations are generally tend toward black tones or white tones, since these have an elegant look to them that can not be produced by other brighter or duller colors. Besides the fact that these colors are easy to mix and match with most other colors. This also gives you the freedom to choose the rest of your materials for the room-such as carpet and curtains- with more independence since you don’t have to worry about the issues of clashing horribly.